Yong’s father wants a better life for his family, but doing so means leaving them behind in China in the mid 1800s. As the oldest son, Yong thinks he should stay home and help his grandmother care for his brothers and sisters but his father doesn’t agree. So begins their journey to Australia during the great gold rush. 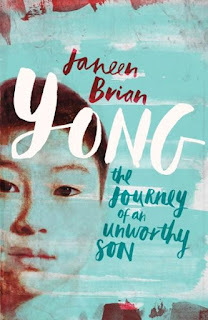 Janeen Brian takes us inside Yong’s heart and mind so we can share his anguish, his longing to rebel and his feelings of guilt. What is it like to bear the burden of your father’s expectations without being privy to his feelings? Is it always right to obey without question? When is it time to resist orders from authority? Although Yong believes he is an unworthy son, he shows us along the way how full of love, compassion and honour he really is. We share his worries, watch dramatic events similar to those that really occurred and experience the blind prejudices that were rife at the time. Yong might be a middle-grade reader, but its heart will speak to all lovers of history and drama. Based on real events in a world and time long past, Yong’s story shares from the inside what it’s like to be a hopeful migrant, an outsider and, at times, helpless at the hands of others whose motives might not be pure. Yong is must for every school library.